Opera is a lively new Italian firm which specializes in walnut loudspeakers, either bookshelves and floorstanders. The man behind the Opera designs is G.P. Matarazzo, loudspeakers designer and journalist for the Italian paper magazine Suono. The Opera Terza (it means Opera The Third) are slick and tall walnut towers (103H x 20W x 26D in cm) with two 13 cm woofers and one tweeter. The cabinet is incredibly sturdy as it is entirely built in solid 2.5 cm thick walnut and its finish is simply gorgeous, a picture will be available soon. Being thin and tall they take the same room of a tiny bookshelf over its own stand. This solution has many pros and few cons: you can get the same realistic soundstage and precision of a tiny bookshelf but with plenty of bass. Not the entire cabinet is used as a volume for the speakers: actually there's a separated volume you can fill with sand or other different damping materials. This way the already heavy Opera Terza become heavier and, filling with sand makes the weight of these babies increase till 25 Kgs each (more than 50 lbs each). To do this you need to unscrew the little foot of the speaker (a 30 x 25 x 2.5 solid walnut rectangle) and fill the cavity with the choosen material. List price, in Italy, is around 1500 $. Note that it can be higher outside of Motherland. The Opera Terza have a warm personality, they sound relaxing and never, never aggressive nor *razor sharp*. The high range is sweet, and you note this especially with female voices, clean, smooth and very sensual. Percussive instruments such as cymbals, maracacas etc are lively and never too tizzy and fatiguing. Sometimes I'd prefer a more dynamic reproduction of this frequency range and also a little more *liquidness* but we can't ask too much, given the price of these slick floorstanders. The mid range is a perfect match for the high range as it is smooth and warm and you can notice this with male voices, only sometimes too *warm* and *full bodied*. Thanks to this *warm* personality the Opera Terza sound big, bigger than they appear and they seem to invite you to turn the volume knob clockwise more than usual: they never shout nor scream. As the volume increases the sound gets bigger and bigger till the physical limit of the loudspeakers: when too much is too much. Now let me describe the best quality of these floorstanders: the bass range. You wouldn't believe what these tiny 13 cm woofers are capable of and you start searching for a subwoofer hidden somewhere into the listening room. With many CDs (and LPs) the windows panes of my listening room become to shake and you start to hear the low frequencies with your body more than with your ears. The lows aren't just powerful and walls-shaking but also incredibly deep: some organ works recordings can make you feel inside a big church as your body starts to tremble shaked by the frequencies below 40 Hz. These babies are TRUE full-range speakers and they can make you forget the need for subwoofers easily. I'm not saying that the bass range can rival with the one of a cleverly built subwoofer (clearly it can outperform those cheap tiny active subwoofers which are all the rage into HT systems), just that you can't ask for more. At this price the Opera Terza can rival with speakers that cost two times their price, should we ask for more? Thanks to the amazing bass range these floorstanders are dynamically impressive: sure, these babies can rock. Feed them with any kind of Music, huge orchestral works, walls shaking rock or electronic pop music...they will impress you with a fast, punchy sound that, again, you wouldn't believe coming out from these small sized loudspeakers. Punchy is the right word to use: listen to the Sheffield drum record with these speakers and you'll get an idea of what is *dynamic* in the bass range. But they don't sound big, boomy and nasty, NO! thier sound is, in csale, the one of big high-end floorstanders, powerful, plenty of bass, walls-shaking but precise and delicate when needed. The 3D imaging is good, the soundstage is wide and deep, extended well beyond the cabinet of the Terza. The soundstage height is excellent and easily above the ceiling with the right recordings. They require some time to find the right position into the listening room: avoid to place these speakers too near to your listening chair, as the sound can easily become too much *in the face*. I've installed them with the rear wall at a distance of 180 cm and very far from the lateral walls. A carpet in front of them is necessary to improve the depth of the soundstage and minimize the *in the face* attitude. A little toe-in can be useful, too. These Italian floorstanders seem to prefer solid state amplifiers or, at least, these have been the results of my tests. The bass range needs to be *driven* with the authority that normally tube amplifiers don't have. Plus, especially if the tube amplifier has a rather *old style* personality, the warm sound of the Opera Terza can easily become too warm and, without a strong control of the woofers, the overall reproduction will be rather dull and lifeless. Just give these speakers the amplifier they deserve: fast, punchy and lively as only a high current hi-quality solid state amplifier can be (ok, there are also some tube amplifier that sound this way but...). I've tried with two different tube amplifiers, one of the *old style* type while the other was of the *modern* school (lively and punchy). With both amplifiers the rock Music needed still more punch, as it is never *enough*, and since these speakers can really make your walls shake it should be a pity to limit their performance with the wrong amplifier. They can sound loud, very loud, even with few watts but they really shine when coupled with a powerful amplifier. The same observation applies to power cables: avoid anything too smooth and warm, choose fast and lively cables instead. My Next (another Italian hi-end firm) cables were a perfect match. These speakers have four non-adjustable spikes: you know what this means. 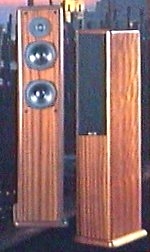 With a uneven floor it would be impossible to find a stable position for these tall speakers. I'd suggest to drill a fifth hole exacly in the middle point between the two rear spikes: unscrew the two rear spikes and screw one of these into the fifth hole so to have three stable points for your speakers. I've already mentioned the cavity you can fill with some damping material: I've found that filling these with sand (river sand, without salt) is a very easy and cheap upgrade: the bass becomes even firmer and punchier and the 3D imaging, thanks to the extra wight, become stabler and better focused. The Opera Terza are very clever floorstanders: at the same price of a mid-fi bookshelf + a pair of decent stands they offer a real full-range sound with a bass so deep and powerful that every bookshelf can only dream of. These floorstanders can sound Music for hours and hours without listening fatigue and so they should be seriously considered by the Music lover searching for a big, punchy and classy sound. If you add the real walnut cabinet (very high WAF!!!) and the amazing quality of the finish you'll understand why these speakers have a Q/P ratio outstandingly high. Compare these speakers with similar priced floorstanders which, if you're lucky enough, have just a MDF cabinet with walnut finish (if not worse) and then let me know. To me the Italian HiFi scene is mature to earn its well deserved space into the Gotha of the Hi-End worldwide.